If there’s one appliance most homeowners rely on to get chores done, it’s the clothes dryer. Don’t let your dryer become a fire hazard because it’s not cleaned regularly and properly. Yes, cleaning the lint trap in your dryer is a good practice, but it’s not enough to prevent a fire from sparking in your dryer vent. To keep your dryer efficient and safe, replace any vinyl or plastic flexible transition ducts between the dryer and the main vent (often located inside a wall) with a a semi-rigid metal transition duct, since plastic and vinyl transition ducts can catch fire, unlike the semi-rigid metal ducts. When your dryer vent system can’t exhaust properly, it overheats and can threaten your home, health and safety. You can clean your dryer vent system yourself, but if you don’t know how or want expert advice, a professional cleaning service like Healthy Living Carpet & Tile Cleaning can clean and inspect your system to make sure it’s safe, as well as answer your questions. While the buildup in a clothing dryer presents many dangers to homes and its occupants, there are ways to prevent many of these hazards from occurring. 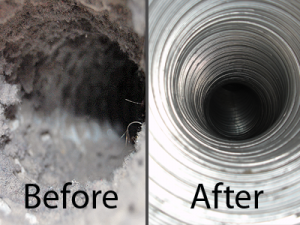 Dryer vents can be professionally cleaned by Healthy Living Carpet & Tile Cleaning. We have the tools and training needed and reach deep into the dryer vent and clean all debris build-up that occurs along the lining of the ventilation pipes. During the process of cleaning the dryer vent, we will insert a long vacuum tube and snake brush into the ventilation pipe. The vacuum will be used to eradicate any loose debris within the venting pipe causing blockage. More solid masses of debris that may be attached to the walls of the ventilation pipe will be scrapped away with the snake brush and then vacuumed out. We will take special care in the elbows and bends throughout the dryer venting pipe as these are problematic areas that can quickly build up with lint and other debris. Ventilation pipes typically range from five feet to 40 feet in length, depending on where the appliance is located and an outside venting site is installed. Dryer vents can become clogged and lead to devastating fires. Prevent this by opting for regular dryer vent cleaning. For homes that use the dryer more than two times per week regularly throughout the year, the cleaning services sought should be increased accordingly. Limit the use of dryer sheets when drying clothing and liquid fabric softener in the washing machine. Residue from dryer sheets can clog your dryer’s lint filter and fabric softners can deposit oils and chemicals on some fabrics that may become flammable in the dryer. When possible, hang clothing, heavy bedding, pillows and other large articles outside to line dry. Periodically, it is okay to remove the back of the dryer to vacuum out lint that is trapped behind the machine as well. However, the homeowner should have adequate knowledge of the machine before they ever attempt to take it apart.The appliance should always be unplugged and disconnected from gas lines before attempting this service for the safety of the home and its occupants. Though your dryer vent is relatively short, it is still best to have it cleaned professionally and set up a schedule for regular cleaning, probably every year or so depending on your laundry habits. If you forego professional services, make sure you get to the vent that connects from the back of your dryer to the window outlet as well as inside the dryer. Always unplug the dryer from the wall outlet before doing any work. Depending on the type of dryer you have, it should be fairly easy to open the access panel to clean around the machine components themselves. Removal of this buildup is easier with some machines than others. One advantage to having Healthy Living Carpet & Tile Cleaning clean your system is that we have seen just about every make and model and will likely be able to clean the interior components more efficiently than you will. Plus, you’ll have the assurance that the job was done correctly and safely.